Misha's fun and easy personality has lead his piano studio to thrive since 1986, when he first started teaching in his native Moscow. His deep understanding of many styles of music, from Jazz and Classical to Sacred, coupled with his ability to perform just about anything, made him a popular pianist and organist in Atlanta, leading to his positions as choir accompanist at Glenn Memorial UMC and music director at WCUMC, as well as music teacher at Atlanta International School and at GA State University. 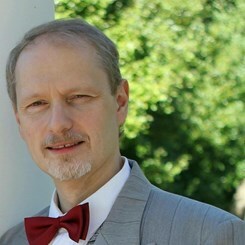 Misha's teaching philosophy is based on the classical European approach to piano teaching. He also teaches his students how to play contemporary and popular music, how to compose and improvise, and how to better understand the history and technology of music. Misha's funny and entertaining personality ensures the success of his students in learning music: from beginners to advanced professionals who perform across the Atlanta Metropolitan area, and study in many prestigious music schools all over US. Misha has published over twenty five books on music and piano. Three of them ended up on the best-sellers list, Jazz Piano Chords being the publisher's number one best-seller for twelve years. He also wrote music for over a hundred TV shows, including music used on One Life To Live and All My Children on ABC; Chris Isaak Show on Showtime; Passions on NBC; and First Monday on CBS. His music was also featured on Good Morning America on ABC, and he was featured as on-screen organist on Constantine on NBC. Misha's students include first-place winners for the Georgia Reflections Composition Competition, Chopin's Young Artist Competition, and Duguesne Young Artist Competition. He is also an experienced adjudicator, having judged the Chopin Young Artist Piano Competition, National Federation of Music Clubs, and various local auditions. Misha graduated from Boston University with Master of Music in Music Education, and he holds three undergraduate degrees, from Belmont University in Music Composition, Moscow Conservatory School in Music Theory, and Moscow College of Improvised Music in Improvisation and Group Leadership. He won Stereotypes and Nations Composition Competition in Krakow, Poland; Concerto Aria Composition Competition at Belmont University, Nashville, TN; and Lionel Hampton Jazz Festival, Moscow, ID, named Outstanding Piano Player. Many of Misha's students have had learning issues, and he has discovered how to create a sensitive, friendly, and creative atmosphere in which his students gain confidence, skill, and much needed knowledge in their life even outside of the piano studio. For years, Misha has had students from ages four and a half to seventy three, remain mesmerized by the music of Bach and Rachmaninoff, Cole Porter, Green Day, Billy Joel, and Mozart. Piano is such a great instrument to be your choice for yourself or your child to discover the world of music at your fingertips, and Misha is more than capable to be your guide in this journey. Request Lessons with Misha today!